Tickets are still available for this Sunday 7 January 2018. Playwright, director and actor Gordon Clarkson is holding a charity gala in Margate this weekend in memory of his wife, Joy. Joy died almost a year ago from cancer and Gordon is hosting an event in her name to raise money for all the charities that were close to her heart. The event is from 2.30 pm until 5.00 pm. Doors open at Margate Winter Gardens at 2.00pm and tickets can be bought for £10 on the door, by ringing 01843 292795, or online on the Margate Winter Gardens website. The event, called ‘Jumping for Joy’, will donate all the money raised to Macmillan, the Royal Variety Charity, the Royal Theatrical Fund, the Equity Benevolent Fund and Turn2us. “Some of her beautiful handmade costumes will be worn, and so her legacy will live on for a long time. In the programme notes, we conclude by saying that the show will be like her: fun, light, sometimes poignant but never mawkish. 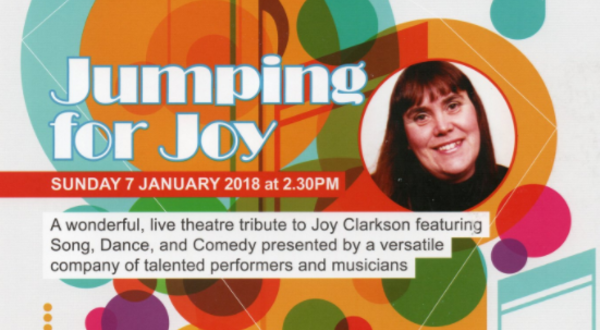 “The cast and musicians, plus the management and staff of the Winter Gardens, are delighted to be ‘Jumping for Joy’ for the good causes that will benefit." Joy had worked at the Margate Winter Gardens and the event will feature some of her friends and colleagues from the entertainment industry.